USS Alabama (BB-60) was a South Dakota-class battleship that entered service in 1942 and fought in multiple theaters of World War II. In 1936, as the design of the North Carolina-class neared completion, the US Navy's General Board gathered to address the two battleships that were to be funded in Fiscal Year 1938. Though the Board was leaning towards building two additional North Carolinas, Chief of Naval Operations Admiral William H. Standley preferred to pursue a new design. As a result, the building of these vessels was delayed to FY1939 as naval architects began work in March 1937. While the first two battleships were officially ordered on April 4, 1938, a second pair of vessels was added two months later under the Deficiency Authorization which passed due to increasing international tensions. Though the escalator clause of the Second London Naval Treaty had been invoked permitting the new design to mount 16" guns, Congress requested that the battleships stay within the 35,000-ton limit set by the 1922 Washington Naval Treaty. In laying out the new South Dakota-class, naval architects designed a wide spectrum of plans for consideration. A key challenge proved to be finding approaches to improve upon the North Carolina-class while staying within the tonnage restriction. The answer was the creation of a shorter, by approximately 50 feet, battleship that utilized an inclined armor system. This offered enhanced underwater protection relative to earlier vessels. As naval leaders called for vessels capable of 27 knots, designers sought a way to obtain this despite the reduced hull length. This was achieved through the creative layout of boilers, turbines, and machinery. For armament, the South Dakotas matched the North Carolinas in carrying nine Mark 6 16" guns in three triple turrets with a secondary battery of twenty dual-purpose 5" guns. These were supplemented by an extensive and constantly changing array of anti-aircraft weapons. Construction of the fourth and final ship of the class, USS Alabama (BB-60) was assigned to Norfolk Naval Shipyard and commenced on February 1, 1940. As work moved ahead, the US entered World War II after the Japanese attack on Pearl Harbor on December 7, 1941. Building of the new vessel proceeded and it slid down the ways on February 16, 1942, with Henrietta Hill, wife Alabama Senator J. Lister Hill, serving as sponsor. Commissioned on August 16, 1942, Alabama entered service with Captain George B. Wilson in command. After completing shakedown and training operations in the Chesapeake Bay and Casco Bay, ME that fall, Alabama received orders to proceed to Scapa Flow to reinforce the British Home Fleet in early 1943. Sailing with USS South Dakota (BB-57), this action was necessary due to a shift of British naval strength to the Mediterranean in preparation for the invasion of Sicily. In June, ​Alabama covered the landing of reinforcements in Spitzbergen before taking part in an attempt to draw out the German battleship Tirpitz the following month. Detached from the Home Fleet on August 1, both American battleships then departed for Norfolk. Arriving, Alabama underwent an overhaul in preparation for redeployment to the Pacific. Departing later that month, the battleship transited the Panama Canal and arrived at Efate on September 14. Training with carrier task forces, Alabama sailed on November 11 to support American landings on Tarawa and Makin in the Gilbert Islands. Screening the carriers, the battleship provided a defense against Japanese aircraft. After bombarding Nauru on December 8, Alabama escorted USS Bunker Hill (CV-17) and USS Monterey (CVL-26) back to Efate. Having sustained damage to its port outboard propeller, the battleship departed for Pearl Harbor on January 5, 1944 for repairs. Briefly drydocked, Alabama joined Task Group 58.2, centered on the carrier USS Essex (CV-9), later that month for attacks in the Marshall Islands. Bombarding Roi and Namur on January 30, the battleship provided support during the Battle of Kwajalein. In mid-February, Alabama screened the carriers of Rear Admiral Marc A. Mitscher's Fast Carrier Task Force as it conducted massive raids against the Japanese base at Truk. Sweeping north into the Marianas later that month, Alabama sustained a friendly fire incident on February 21 when one 5" gun mount accidentally fired into another during Japanese air attack. This resulted in the death of five sailors and wounding of an additional eleven. Following a pause at Majuro, Alabama and the carriers conducted attacks through the Caroline Islands in March before covering landings in northern New Guinea by General Douglas MacArthur's forces in April. Proceeding north, it, along with several other American battleships, bombarded Ponape before returning to Majuro. Taking a month to train and refit, Alabama steamed north in early June to take part in the Marianas Campaign. On June 13, it engaged in a six-hour pre-invasion bombardment of Saipan in preparation for the landings two days later. On June 19-20, Alabama screened Mitscher's carriers during the victory at the Battle of the Philippine Sea. Remaining in the vicinity, Alabama provided naval gunfire support to troops ashore before departing for Eniwetok. Returning to the Marianas in July, it protected the carriers as they launched missions in support of the liberation of Guam. Moving south, they conducted a sweep through the Carolines before striking targets in the Philippines in September. In early October, Alabama covered the carriers as they mounted raids against Okinawa and Formosa. Moving to the Philippines, the battleship began bombarding Leyte on October 15 in preparation for landings by MacArthur's forces. Returning to the carriers, Alabama screened USS Enterprise (CV-6) and USS Franklin (CV-13) during the Battle of Leyte Gulf and later was detached as part of Task Force 34 to aid American forces off Samar. Withdrawing to Ulithi for replenishment after the battle, Alabama then returned to the Philippines as the carriers struck targets across the archipelago. These raids continued into December when the fleet endured severe weather during Typhoon Cobra. In the storm, both of Alabama's Vought OS2U Kingfisher floatplanes were damaged beyond repair. 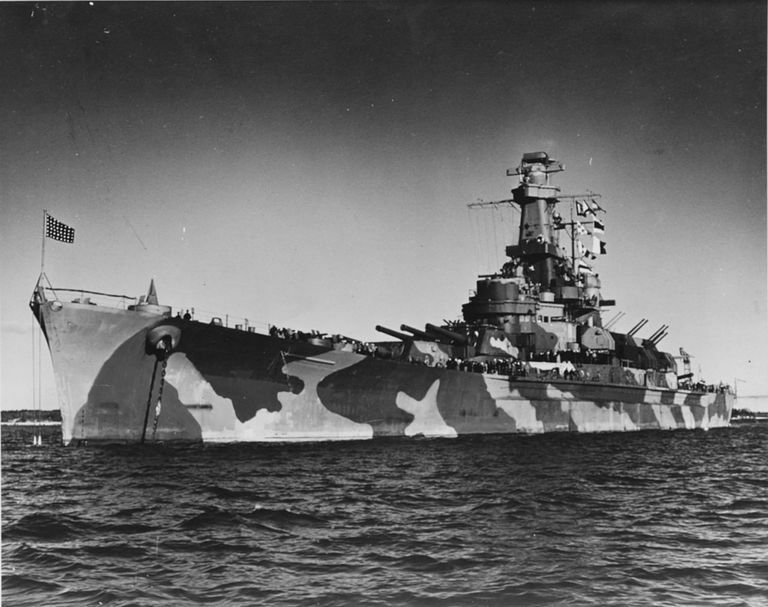 Returning to Ulithi, the battleship received orders to undergo an overhaul at Puget Sound Naval Shipyard. Crossing the Pacific, it entered drydock on January 18, 1945. Work finally was completed on March 17. Following refresher training on the West Coast, Alabama departed for Ulithi via Pearl Harbor. Rejoining the fleet on April 28, it departed eleven days later to support operations during the Battle of Okinawa. Steaming off the island, it aided troops ashore and provided air defense against Japanese kamikazes. After riding out another typhoon on June 4-5, Alabama shelled Minami Daito Shima before proceeding to Leyte Gulf. Steaming north with the carriers on July 1, the battleship served in their screening force as they mounted attacks against the Japanese mainland. During this time, Alabama and other escorting battleships moved inshore to bombard a variety of targets. The battleship continued to operate in Japanese waters until the end of hostilities on August 15. During the course of the war, Alabama did not lose a single sailor to enemy action earning it the nickname "Lucky A." After assisting with initial occupation operations, Alabama departed Japan on September 20. Assigned to Operation Magic Carpet, it touched at Okinawa to embark 700 sailors for the return voyage to the West Coast. Reaching San Francisco on October 15, it disembarked its passengers and twelve days later hosted the general public. Moving south to San Pedro, it remained there until February 27, 1946, when it received orders to sail to Puget Sound for a deactivation overhaul. With this complete, Alabama was decommissioned on January 9, 1947 and moved to the Pacific Reserve Fleet. Struck from the Naval Vessel Registry on June 1, 1962, the battleship was then transferred to the USS Alabama Battleship Commission two years later. Towed to Mobile, AL, Alabama opened as a museum ship at Battleship Memorial Park on January 9, 1965. The vessel was declared a National Historic Landmark in 1986.